The various ways the various worlds are trying to murder you. 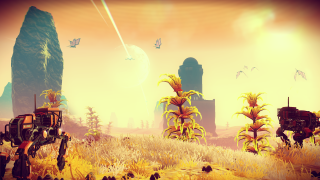 No Man's Sky is nearly here, and it's arriving three days later on PC (note that the game's Steam page has been updated since Andy's article about the delay, so I guess it's been confirmed!) That's a bit annoying, but at least we'll have more time to prepare for the various hazards trying to murder us inside the game. Those hazards include, but are not limited to, acid rain, radiation, alien creatures and hostile robots, and all are detailed in a new No Man's Sky trailer - the fourth and final in a series answering the now-infamous question, "But what do you actually DO in No Man's Sky?" Turns out you die in No Man's Sky! Like, probably quite a lot. You also trade, fight and, above all, explore.